Turn the everyday bathroom break into a chance to record your deepest thoughts with this quirky guest book. Everyone loves a little toilet humor! 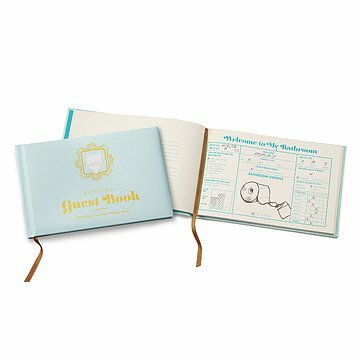 Turn the everyday bathroom break into a chance to record your deepest thoughts for the ages with this quirky guest book. Let friends and family mark each trip to the loo with thoughts, doodles, and assessments of the local décor so others can enjoy their ruminations from the can for decades to come. This padded hardcover journal, complete with foil stamping and a ribbon to mark its 112 pages, will make any water closet just a little bit cheekier. Made in China. Love the unique - and Uncommon Goods is just the place to find something different, useful, organic, handmade or just plain entertaining. Great quality and full of laughs! I bought this for my father in law who always finds amusing things for the guest bathroom. This was something he had never seen before - so unique! The book quality is outstanding and well built. The pages are all the same inside, but boy oh boy did they think of everything to get a good laugh! This book looks chic, but has some dirty humor. The contrast makes it hilarious as a white elephant/dirty santa gift exchange. What a fun, funny gift for that special person! This is an incredibly funny, unique gift for that person that has everything, including a great sense of humor! Awesome product! Especially for parties! I purchased this book for my condo-warming gathering I was having. Since I didn't have an entry way table to put a traditional guestbook on yet, I came across this Bathroom Guestbook to use instead! It was a big hit for my guests, and flipping through some of the pages that they wrote on were very funny. It was used in a gift exchange. All families were interested esp those with boys in the family. Okay, so the couple whom I gave the bathroom guestbook as a gift absolutely loved it, and the entirely family and friends thought this was hilarious. Caution: if you are planning to give it to humorless or serious people, you might want to rethink before you purchase it.